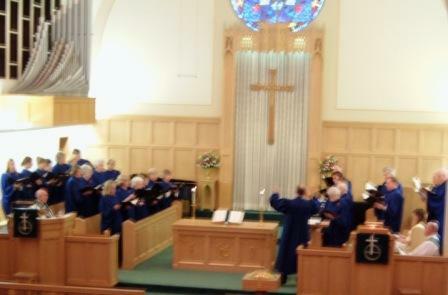 This choir provides the primary musical leadership for worship at First United Methodist Church. The Choir sings at every 10:45 a.m. service (except the first three weeks of August), as well as special services. Rehearsals-Thursday evenings in the Sanctuary from 7-8p.m. ; Sunday mornings at 10:15 to prepare for the 10:45 service. Membership is open to all high school aged students and up. No audition is required. Our members are very active and can't possibly be at every rehearsal and every service. We encourage members to participate to the fullest extent possible, but understand that they will need to miss occasionally. We presently have approximately 50 members with an average Sunday morning attendance of 30-35. The Sanctuary Choir is directed by Bob Weiss and accompanied by Anita Hutton. What is the choir singing in coming Sundays? Check our our upcoming repertoire here. The Handbell Choir is open to high school aged ringers and up. Anyone with basic knowledge of note reading is welcome to join. Rehearsals are on Wednesday afternoons from 4:45-5:45 p.m. from September through April or May. Are you interested in playing handbells? Email Bob Weiss or call him at 203-1672 and let him know. Vocal soloists and instrumentalist are used extensively at FUMC. Soloists provide special music for all 8:15 a.m. services and frequently participate in special programs. Instrumentalists (brass, wood-winds, strings & percussion) are used frequently to accompany anthems and provide special service music. Musicians interested in participating in this aspect of the music program should contact Director of Music, Bob Weiss. In the Spring of 2006, the Sanctuary Choir recorded their first Christmas CD. Additional music was provided by Anita Hutton, the Handbell choir and others. 100% of all sales have been donated to the Boys and Girls Club of Carbondale. Copies are available for sale in the church office for $20. You can see more about this project here. Our most recent recording is a double CD -- 14 hymns and 14 Christmas Carols performed by pianist, Anita Hutton. 100% of all sales will be donated to the Carbondale "I Can Read" Program. Copies are available for sale in the church office for $20. You can see more about this project here.